This commission allowed me to combine two things I like doing, writing and taking photographs. Well, three things, I enjoy playing with photographs in Pixelmator too. At the start I had people like Fred Herzog and Vivian Maier in mind, you can have a look Herzog’s Vancouver street photography here. I wish I had the unobtrusive courage to and capture people in their lives like Maier does in these photos (there’s more about her on Artsy.net here). I am not sure I agree with all of that, but found it interesting to have in the back of my mind as I started wandering about. “The books I love most are like open cities, with all sorts of ways to wander in.” (Robin Sloan Mr Penumbra’s 24 Hour Bookshop). The cities I love most are those with all sorts of ways to wander in, and Wakefield with its tightly packed but very different zones is perfect. As pictures and notes accumulated I began to think about how I’d hang everything together. 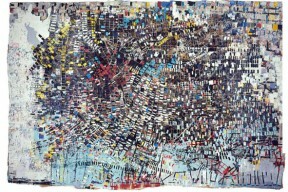 In Miami I came across the paintings of US artist Mark Bradford, both his palimpsestic work but also massive canvases such as Kryptonite which were like settled and zoned abstractions. Influenced by this and other work, the abstract documentary soup of our web response to the Quay Brother’s OverWorlds and UnderWorlds in Leeds, or the kind of online map defined storytelling that I have dabbled with, but has been done much better by Kate Feld’s Rainy City Stories and many similar projects, I was thinking of embedding my Wakefield piece in an organic visual form. But as characters began to emerge and shape my notes, choose pictures, I began to order things around a the idea of a twenty-four hour period, form defined by time. That’s when I remembered Kate Griffin’s blog and the WordPress Theme Autofocus. This meant as a writer I had a linear structure along which to play with narrative, and once Ross Featherstone tweaked a blog format’s idea of time, you could follow that too, or you could pick and choose, times, directions in time, and characters to follow. I lost the spatial element but hopefully, as with all readers, you’ll create that yourself as by wandering in the piece. Either a reinventing Wakefield you know, or inventing your own. Once I knew what I was doing, I sometimes wrote from pictures, sometimes I went out to take pictures to go with things I’d written, sometimes I sourced images, sometimes it was an amalgam, sometimes I wish I’d written a shorter piece without so many sections. Wakelost Wakefound started off in the present tense, the new station opening fixed it in the past. I became conscious of things I couldn’t write about or photograph because in Wakelost Wakefound time, they hadn’t yet happened/appeared. As I wrote Wakelost Wakefound I found myself writing more and more on screen, I don’t just mean on the computer, I mean in WordPress, pushing Update and rereading on the site, then going back into Edit Page to work the text, updating and rereading, then back to Edit. I found it impossible to write this piece in the normal way I would write, offline. But thinking about all this now, I remember that there was a different physical edge to the writing, I was looking at my words in a different more tentative, more alive, more energetic space, than they would have been in Pages or Neo Office documents saved and resaved in Dropbox. And even though I was looking at the same words, through the same piece of glass, on the same white background, I simply didn’t feel as if I knew they would work until they hung in that in-between space powered not just by the plug into my wall but whatever energy drives the internet.